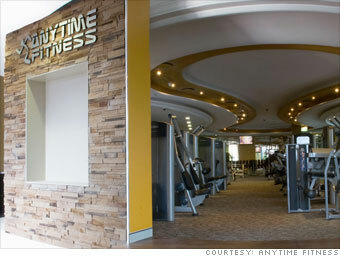 Anytime Fitness, a chain of gyms, offers customers workouts at their convenience. The clubs are open 24 hours a day. Members can exercise even when a club is not staffed, thanks to proprietary access software, security and surveillance technology. Co-founders Dave Mortensen, Chuck Runyon and Jeff Klinger -- who has since left the company -- opened the first club in 2002 in Cambridge, Minn. Less than 10 years later, there are nearly 1,600 clubs nationwide with more than 1.1 million members. More than half of the club owners have more than one location. Running an Anytime Fitness gym involves relatively low overhead, because large numbers of employees are not required. Also, owners pay a monthly flat fee of $499 to Anytime, unlike most franchise systems where franchisees are charged a percentage of sales. Startup costs run between $46,299 and $321,899, depending on the size of the gym. Of 147 SBA-backed loans between 2005 and 2010, there were just four defaults.